The Etisalat Easy millions promo has kicked off on 26th of October 2016 and subscribers are cashing out already. The promo is an initiative to reward both old and new subscribers on the Etisalat network. What’s better? Everyone stands a chance to win. 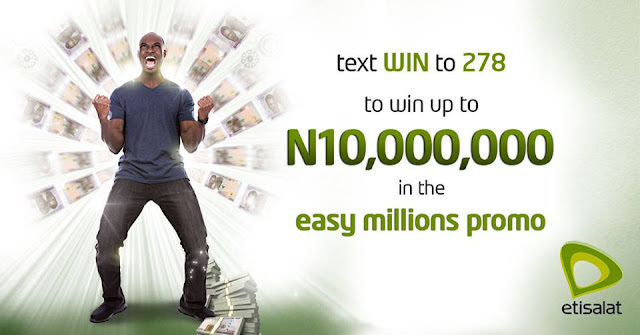 The MEGAJACKPOT whichis already over N10 MILLION and keeps increasing to MEGA MILLIONS will be won by 1 Lucky subscriber. This is the greatest splash of cash and airtime by Etisalat! The promo is ongoing already and so many winners are already smiling to the bank! THE FIRST MONTHLY PRIZE OF N5 MILLION IS TO BE DRAWN ON OR BEFORE 30TH OF NOVEMBER, 2016. Visit www.easymillions.ng for more info.